This was one of those meals that I threw together to use up various oddball ingredients we had hanging around. We had just received a box from Washington's Green Grocer. In it were some finger limes and sweet potatoes; we had black beans in the cupboard amd feta in the fridge. I've been trying to make one vegetarian dish per weekend, so I figured I could use all of these things and come up with something pretty tasty. Originally, I was going to make tacos, but then I found mini naan breads at the grocery store. They're soft and puffy like Greek pitas, and were a more substantial wrapper for the fairly substantial potato/bean cakes. Peel the sweet potato and cut into evenly sized chunks, about 2" square. Put in a saucepan and add water to cover. Bring to a boil over medium-high heat and cook until potatoes are fork tender, about 15 minutes. Drain water and mash potatoes with a potato masher into a smooth puree. Scoop potatoes into a large bowl and set aside for a few minutes to cool. While potato is cooling, wipe out the saucepan and add a bit of olive oil. Cook the onion and scallions until wilted. Add the black beans and cook, stirring regularly, for a few minutes until everything is warm. As you stir the beans, they should break down into a chunky mash - this is what you want. Allow to cool for a few minutes, then add the bean mixture to the bowl with the sweet potatoes. Stir in the seasonings and the egg until well combined. Stir in the cheese and enough breadcrumbs (up to 1 cup) to form a soft dough. Refrigerate dough for at least one hour to firm up even more (it will still be pretty soft). When ready to cook, remove dough from fridge and form into patties about 2-2 1/2" in diameter and 1/4" thick. Cook in a large saute pan with a bit of olive oil until browned on both sides. You'll need to do this in batches. 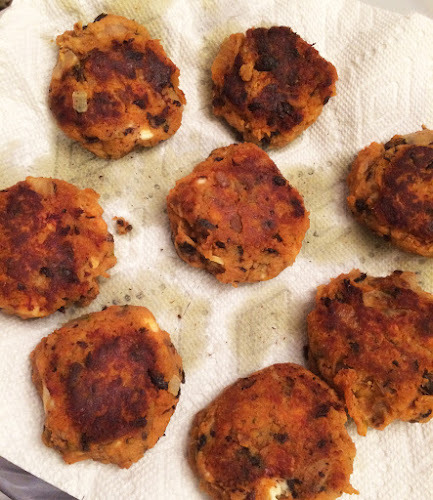 Drain cooked patties on paper towel-lined plates. 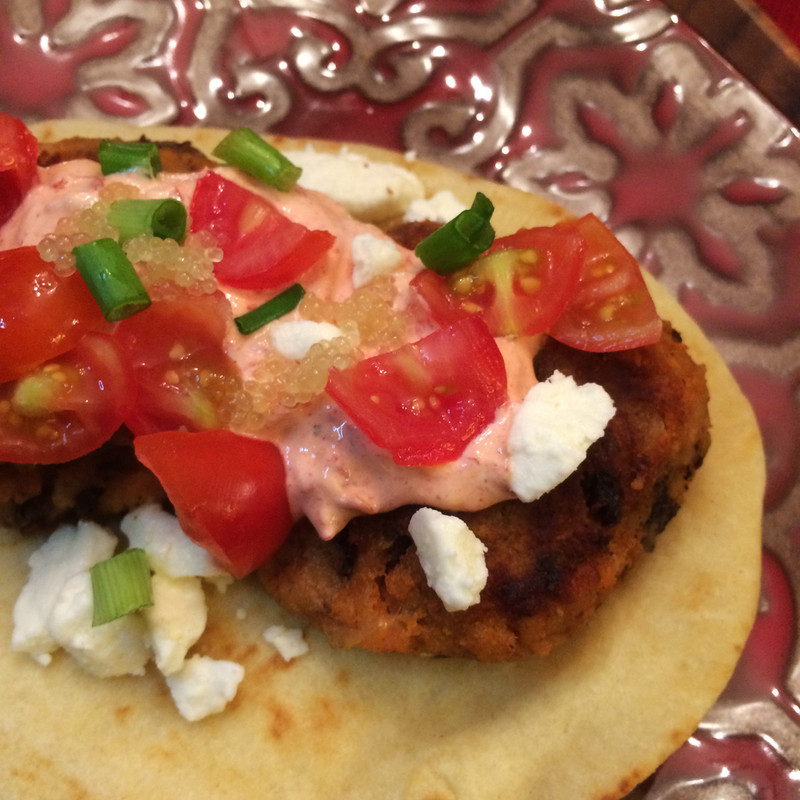 To serve: Place two or more patties on your bread of choice, Top with yogurt, scallions, tomatoes, and feta.